Some students find it hard studying Chemistry. Most of the time, even the basic concepts can be difficult for students to understand after class discussions. 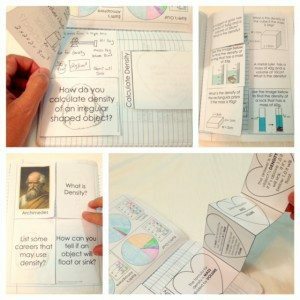 I have found that interactive notebook pages will engage your students in a way that regular notes never could. 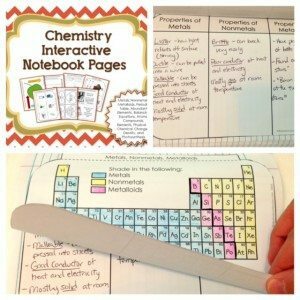 I created a set of Chemistry Interactive Notebook Pages to help teachers and students when studying basic chemistry in the classroom. The mixture of interactive activities included targets several skills like creativity and critical thinking. 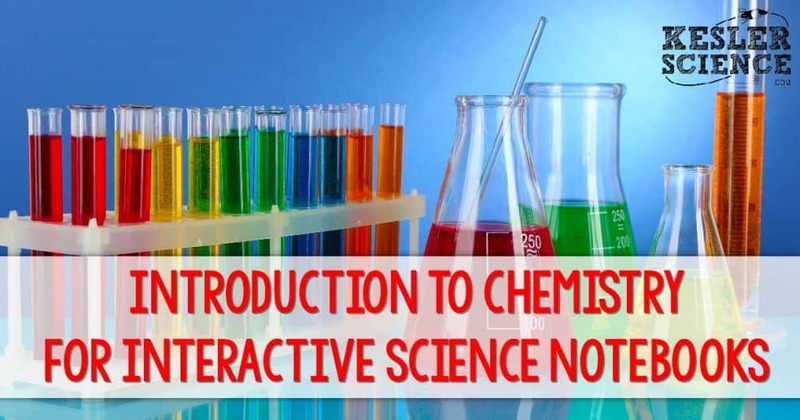 Topics included in this Chemistry INB are the following: Abundant Elements on Earth, Metals, Nonmetals and Metalloids, Physical and Chemical Change, Evidence of Chemical Change, Periodic Table, Atoms and the Subatomic Particles, Elements and Compounds, Density (with Problem Solving), Chemical Equation (including Balancing), and Photosynthesis. When I discuss the abundance of the different elements on Earth I love using the four blank pie graphs. Each pie graph represents the atmosphere, living matter, oceans, and crust plus the abundant elements found on each. 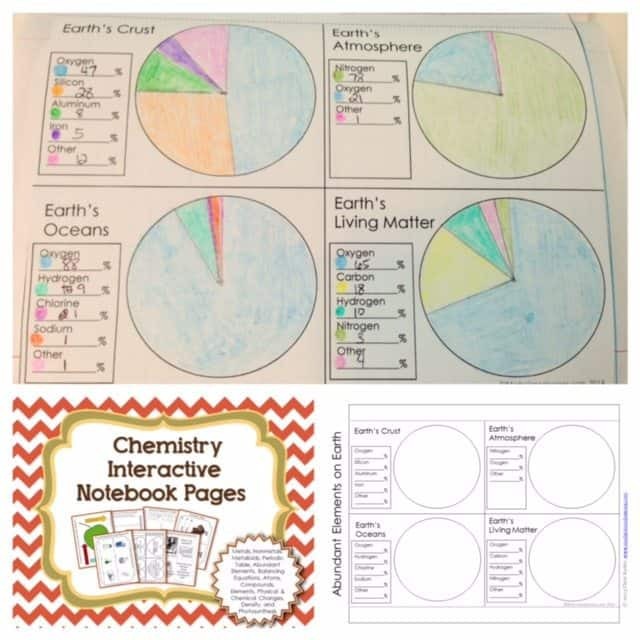 The students will complete the graphs by supplying the percentage of each element and transferring the data on the pie graph. The next activity is all about metals, nonmetals and metalloids. In this portion, a three-page flip book is used. 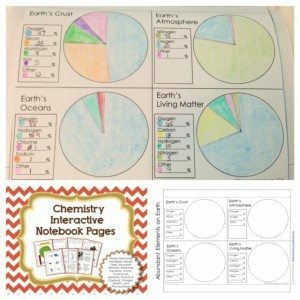 On the first page, the students will shade the periodic table with three different colors that represent each classification. The next is about their properties. The last page is dedicated for three common examples of elements under each classification and their uses. For the signs or evidences of chemical change, this Chemistry INB provides an accordion pull out where the students enumerate the evidences and if possible, draw them. 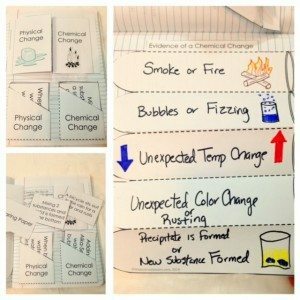 There is also a flippable for differentiating physical and chemical change and a card sort activity with twelve situation cards to be sorted. 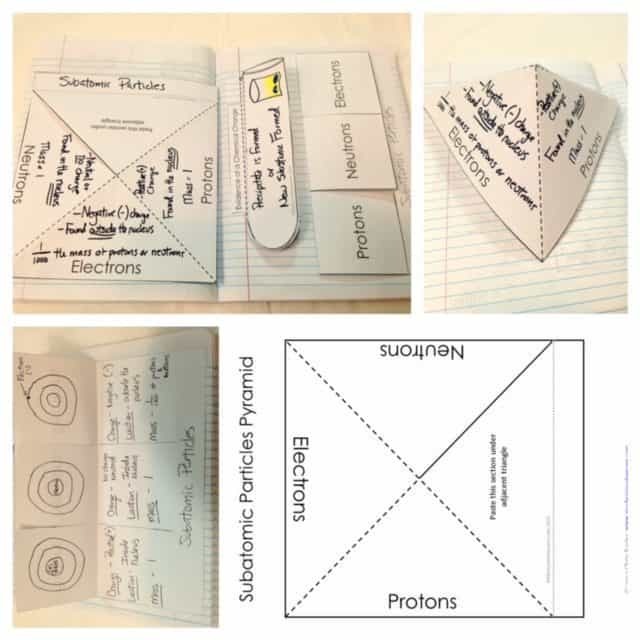 Next is a flip book about the arrangement of the periodic table. This contains four pages that discuss the groups and periods, as well as a questionnaire to explain how these properties are used to classify the elements. There is also a portion dedicated to show how to read each block on the periodic table. The last page will help the student memorize how to get the atomic number, atomic mass, number of protons, electrons and neutrons using acronyms. 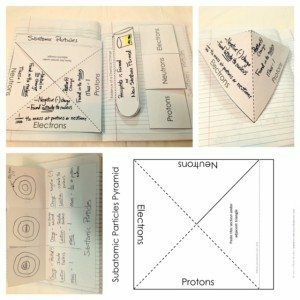 When studying the structure of an atom I use an interactive pyramid and flippable. On each side of the pyramid and each portion of the flippable, the three subatomic particles are written. The data that the students will supply in these portions may include the particles’ mass, electric charge and location. For elements and compounds, a flippable is also used. 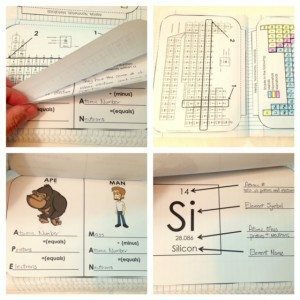 Students will tell who Dmitri Mendeleev is, describe an element and a compound, and tell how to count the number of elements in a certain compound. 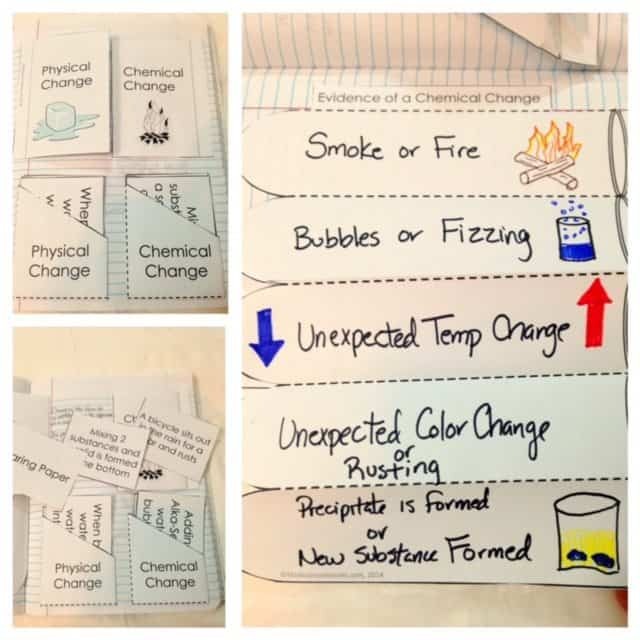 After answering the flippable, there is also a follow-up activity which includes several chemical formulas and symbols and the students are tasked to indicate whether each of them is an element or a compound. They are also required to name the elements in each chemical formula and symbol. Two flippables for density is included in this Chemistry INB. One is dedicated for density alone – who Archimedes is, defining density, careers that may use density, and how to tell if an object will sink or float. The second flippable is meant to show the calculation of getting the densities of both regular and irregularly shaped objects. There are also accordion notes, both blank and filled out, that the students will accomplish. The last activity for density is six practice problems which are presented by another flippable. 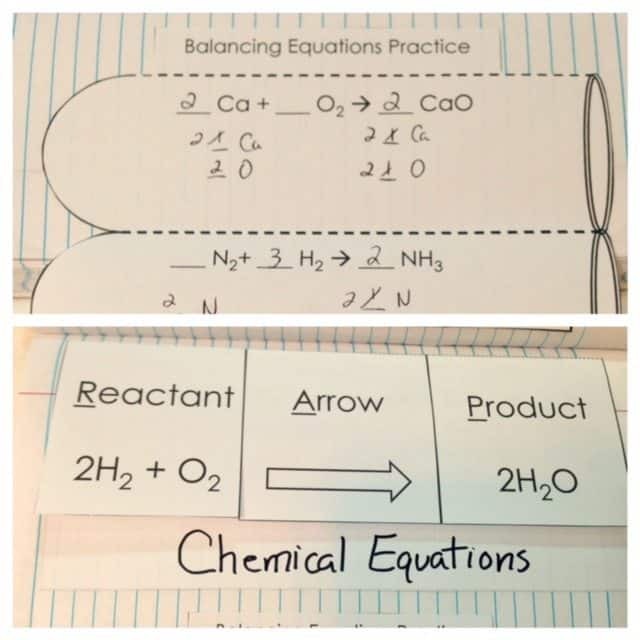 For the chemical equations section I have included a flippable meant to discuss the reactant, arrow, and product. Students will define or describe each. A follow-up activity about balanced and unbalanced equations is also available. As a practice for balancing equations, there are four practice problems presented through an accordion pull. This serves as the last activity for the topic about chemical equation. A four-page flip book on counting atoms and elements is also included. The first page contains common household compounds and the students will be asked to write their chemical equations. The second and third pages are meant for the notes. 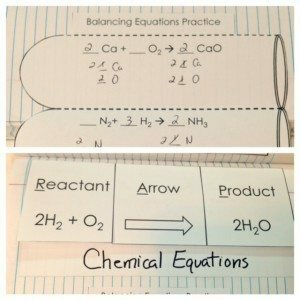 Some symbols and chemical equations are written on the second page and the students will explain each of them. 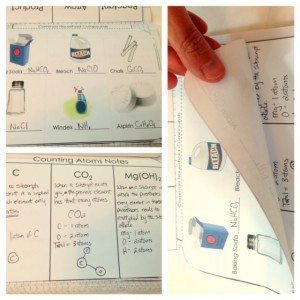 The third page can be their journal and write whatever they have learned in the topic. 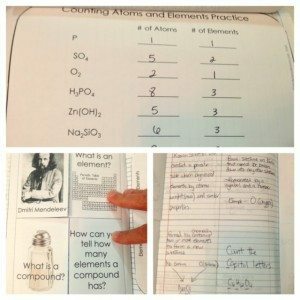 The last page is for the practice wherein the students will identify the number of atoms and elements each symbol or equation has. 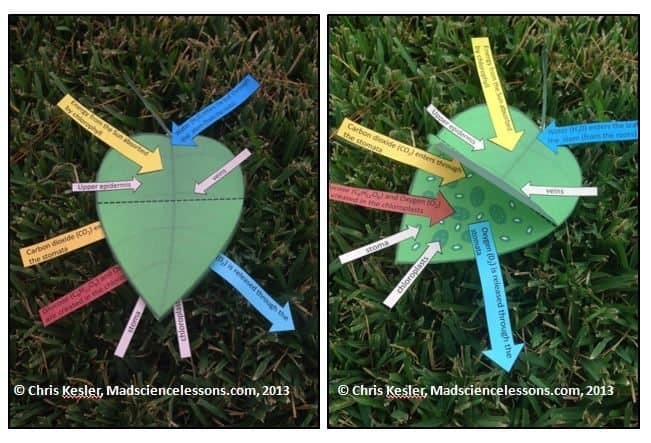 One of my favorites parts of the Chemistry INB is an activity about Photosynthesis. This activity is available in colored and black and white versions. It is actually in 3D which can help you discuss compounds, elements, equations, and photosynthesis all within this one model. This can serve as a supplement in your photosynthesis lesson. There is a portion where you can check how to use this model, so you don’t have to worry. I have also included a blank vocabulary flippable for students to keep up with words they learn along the way. The full set of notebook pages can be downloaded here.